The website Broadway.com did post a tweet some time ago asking fans for questions to Daniel. 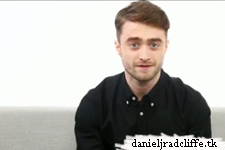 Their 'Ask a Star with Daniel Radcliffe' video is now online in which he answers the questions, from his one-word description of Emma Watson to his favorite film franchise. While dan is talking please make sure that music dominate.I am trying to listen what he was saying but unfortunately the music is dominating. Yes, Alisha is right. I try too, but it's difficult, with the music... english is yet enough difficult to comprehend without music!